On a difficult night for the Denver theater community, Shadow Theatre company chose to honor its founder, Jeffrey Nickelson, with an old showbiz tradition: They went on with the show. Many arrived Saturday evening to see Ma Rainey's Black Bottom unaware of the shocking news that Nickelson had died earlier in the day. After great deliberation, the crowd was told of the decision to present the play. The announcement, by new artistic director and Ma Rainey star Keith L. Hatten, was greeted with applause. It would be a night of emotion and catharsis for actors and audience—but a night that most agreed was necessary, given the circumstances. In many ways, the story of "the mother of the blues" presages Nickelson's own struggles in establishing our city's only professional African-American theatre company. The setting is a recording studio in Chicago, during the 1920's, where the white owner, Mel Sturdyvant (Kurt Soderstom), and Ma Rainey's white manager, Irvin (Brett Scott), ready the facilities for the singer's arrival. We overhear Mel tell Irvin to "keep her in line" and "record the songs and get her out." Next, the piano player, Toledo (Donahue Hayes), trombonist, Cutler (Jimmy Walker), and bassist, Slow Drag (Joe Wiggins) arrive and are shown the green room in the basement to rehearse the four songs that Mel has chosen from Rainey's repertoire. A few moments later, the final band member, Levee (Keith L. Hatten), the trumpet player, enters, pilfers the Coca-Cola that Irvin has assiduously placed on Ma's stool as she requires, and finds his way downstairs to join the preparatory session, where he interrupts the band's camaraderie with the announcement that they are going to play his version of the title number. Wilson's masterful set up, which establishes the inter- and intra-racial conflicts of the drama, is dominated by Hatten's magnetic and edgy performance dominating the subterranean proceedings, while Soderstrom's veiled menacing and Scott's obsequious enabling feed a vague dread of events to come in the main floor studio. When Ma Rainey (Wendelin Harston) and her entourage (Erica Lyn Cain as Dussie Mae and Joseph Jones as Sylvester) show up, the battles of black versus white and black versus black escalate. Harston's Rainey is one tough cookie, leveraging her market power to try the patience of Mel and Irvin whenever the opportunity avails itself. Though the low volume of the canned music strains the credulity of the live band playacting, Harston packs a wallop as the gritty diva, leaving us wanting for more. Wilson's political savvy, which reached its zenith in his final play, Radio Golf, is evident in this earlier play at every level, but particularly the insidious way in which Mel creates divisiveness among the band members, distracting them from their natural class and racial antagonists and leading to the tragic finale. This was not a night to sit in judgment—but in appreciation. Given the economic issues which divided the theatre company and led to Nickelson's recent resignation, that Ma Rainey's Black Bottom should be on tap when the troupe's founder passed should give everyone pause to consider what needs to be done to shore up this vital organization in Denver's cultural life. 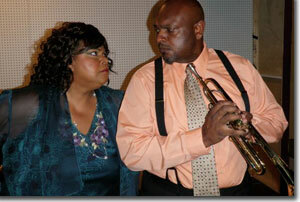 Shadow Theatre Company's production of Ma Rainey's Black Bottom runs through October 17th. 720.857.8000 or shadowtheatre.com.